Trust our string expertise and avoid the hassle of researching for hours. We developed a 1-minute questionnaire that will allow us to give you a precise string recommendation! "​The smoothest poly I have ever played"
Who should try the string? ​Players who would like to transition from a nylon/multi string to polyester. ​Players who are looking for an arm-friendly playing alternative but still want to enjoy the benefits of a poly string. ​​Ideal for hybrid string setups! "The ultimate poly for high performance players!" ​An innovative, high performance string designed for the modern tournament player. The latest co-polyester blend ensures and ideal balance of power, control and access to spin. Enhancements in durability and tension stability will offer the avid player an ultimate, long lasting playing experience. Players who are looking for a well balanced string with great directional and depth control, exceptional durability and access to spin. T1 Firewire, a triangular shaped, new-generation, monofilament string, offers one of the best ball bites and spin potentials in the string industry. Solid durability and exceptional tension stability makes this string the front runner for the competitive weekend warrior. "Same amazing ball bite as T1-Firewire but extra durability and more control"
"The closest you will find a string playing to natural gut!" High-end multifilament string made affordable. With more than 2000 microfibres (16 gauge), Triumph offers ultimate playability and arm friendliness. In addition, this gut-like string will elevate a competitor's playing experience due to its optimal balanced in power, control and touch. This string is a perfect match for hybrid string setups! Players who are seeking a well balanced string for power and control. "The most comfortable poly I have ever played, you would think you put a multifilament or synthetic gut in your frame...!" Players who want to transition from nylon/multifilament/synthetic gut to a polyester string. Players who are looking for a more arm-friendly poly with a softer impact. "Love the low powered feel - it gives me full confidence to hit out on the ball!" New generation, low-powered co-polyester/monofilament string. Ideal for players who like to make their own power and ask for added durability. The hexagonal string structure and Tru Recoil offer players with high racquet speed access to enhanced spin potential. Players who are used to playing with co-polyester strings. Players who are looking for low-powered playing experience. Playing level 3.0-4.0 NTRP at 18 gauge (intermediate - intermediate/advanced level. ​High level juniors age 15 and up. "Soft feel, well balanced for power and control, perfect for the all around player"
This co-polyester/monofilament string offers big hitters well balanced power and control. The octagonal shape adds increased ball bite for players seeking enhanced top spin and a softer playing experience. Players who are used to playing with polyester strings. Players who are looking for a poly string that offers a softer playing experience. 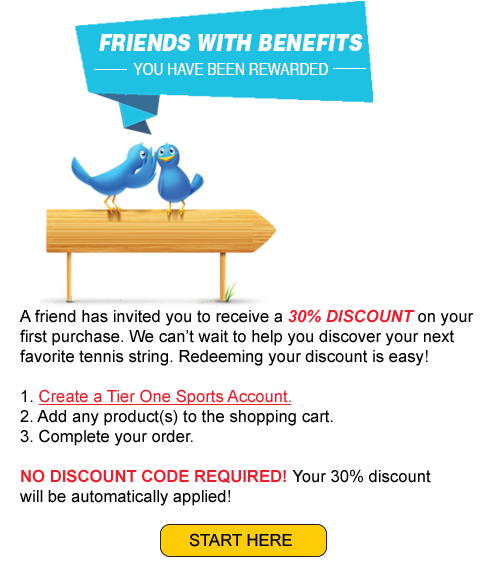 Tier One Sports strings provide exceptional performance ON and OFF the court: Besides great reviews from our customers we now received an important quantitative data point about our strings as well- TENSION STABILITY. Bob Patterson from the USRSA (United States Racquet Stringers Association) provides their readers with a comprehensive list of tennis string lab test results for string stiffness and tension stability. Bob was kind enough to test all of Tier One Sports strings as well. In addition, many of our poly strings are not overly stiff either which could help to prevent arm injuries. In fact, Black Knight and Strike Force RIP are one of the best poly strings in this category!